"We weren't born just to lead a miserable life with no hope of anything better, but to be masters of our own lives!" Reputation is a funny thing, especially when it comes to films. When Sight and Sound, the British film magazine, polled critics in 1962 as to what they considered the greatest films ever made, nestled in at number nine was La Terra trema. The results of this year's poll were recently released (the poll is conducted every ten years), and of the hundreds of directors and critics asked to weigh in, not one had this Visconti film on their top ten. I don't know that this movie deserves the kind of veneration it received in 1962—from our 21st-century vantage point, its politics especially seem rather crude—and in retrospect it doesn't even seem like Visconti's best picture. (I'm partial both to the noirish Ossessione and his magisterial later effort, The Leopard.) But still, there's much about it to admire, especially in the heartfelt depths of its emotions. We follow the travails of many of the Valastros, in both love and work: 'Ntoni and his courtship of Nedda; 'Ntoni's brother, Cola, with his nose for trouble; and their sister, Mara, who has eyes for Nicola, a mason who thinks that he's not good enough to marry a Valastro. Young 'Ntoni Valastro has a scheme: what if the family could bypass the middlemen? It's never been done this way, and the elders in the village and the other families warn him off, but he persists. 'Ntoni convinces the family to mortgage their house to pay for their own boat, for surely riches are soon to be theirs. Things do not go as planned, and we follow the hardships that ensue from the family's ambition for independence, for a better life. While throughout, Visconti's sympathy for the Valastros is evident, he overdoes it just a bit when, as one of the local businessmen take particular advantage of the family, a sign just over his head in the shot reads: "Mussolini." In many ways this is the paradigmatic Italian neo-realist movie, for good and for ill. Getting the camera out of the studio and on location was an extraordinary move for the time, and the landscape and vistas from this hardscrabble world are wonderful, especially when contrasted with the glossy, Hollywood studio productions of the same era. The faces of the actors are marvelously expressive, and Visconti's work here anticipates Pasolini's in The Gospel According To St. Matthew, one of the most moving of all religious pictures. The down side is that a certain amount of craft is sacrificed in the name of authenticity. The performers are disarmingly at ease in front of the camera, but they're not trained actors, and it shows, especially when the story asks a lot of them. 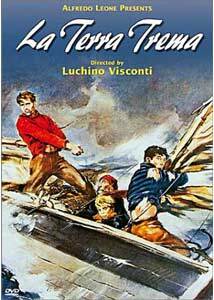 Visconti selected the cast from among the locals, and we're not even given their names—the credits say, "Starring Sicilian Fishermen," and the only ones who get billing are the narrators (one of whom is the director). The narrative doesn't always propel forward—the story is pretty much over with thirty minutes of the running time remaining—and the editing is similarly leisurely, as Visconti is content to show us people opening and closing doors, stopping for a bit of bread, or laughing and laughing at someone else's misfortune. But the camerawork and the images make so much of this film visually gripping that you probably won't mind. In many ways the vignettes that comprise the movie are stronger individually than cumulatively. Still, this is both a vital document in the history of Italian cinema, and one that demonstrates a compassion and empathy for its characters that should serve as an abject lesson for any directorial dilettante dabbling with a story about the working class. Image Transfer Review: Unfortunately this fine film comes to DVD with a shoddy video presentation. The print is full of scratches and debris, and it appears as if the transfer may have been done from two different prints�occasionally, lighting levels will change from frame to frame in the middle of a shot. Much of the Sicilian landscape retains its luster, but that's in spite of what's been done to the movie on DVD, not because of it. Audio Transfer Review: The soundtrack is largely free of interference, but the dynamics are very strange. Sometimes the narration is so faint as to be inaudible, and occasionally music cuts out in the middle of a phrase, sounding more like an editing muff than a creative choice. Visconti favors master shots, and sometimes they're not well miked, so when he does cut in for a close-up, the volume level can change drastically. Extras Review: The English         subtitles are quite legible and error-free, but occasionally they appear when there's no dialogue on the soundtrack. It's unclear to me if the original Italian narration has been edited out at these points, or if the English titles replace Italian ones, but it's rather jarring to be reading somebody's words when there's nobody talking, on screen or off. Visconti's reputation seems to have fallen off some in recent years�perhaps he's been displaced from the top of the pyramid by his countryman Fellini�but his films retain a tremendous power and display their director's mastery of his craft. La Terra trema is a marvelous example of Italian neo-realism, one less familiar than, say, Rome: Open City or The Bicycle Thief, and is full of rewards for students of the movement.